The Boston Chapter of American Outlaws threw a really big tailgate party for US v Spain at Gillette Stadium on Saturday. Like 1500 people big. As you can imagine, this required extensive planning...and a whole lot of meat. I was excited by the challenge of producing veggie food on a larger scale, so I volunteered to make and grill veggie burgers. By that I mean I volunteered my dear friends to help me make veggie burgers. And so, on Wednesday I went shopping for zucchinis and squashes and carrots etc, etc. 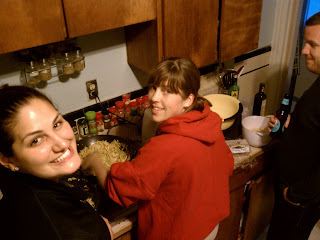 And on Thursday I convinced six good friends to work, assembly line style, in exchange for pizza. I also took over their kitchen. Believe it or not, we managed to produce 70 veggie burger patties on a $27 tab. 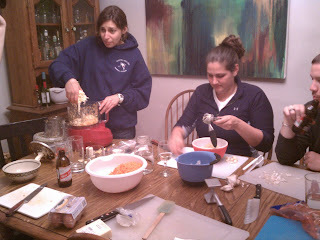 Now, some ingredients, like the rolled oats and spices, were things we already had on hand. But still, $27 is pretty modest for 70 veggie patties, no? I've spent double that on frozen veggie burgers. 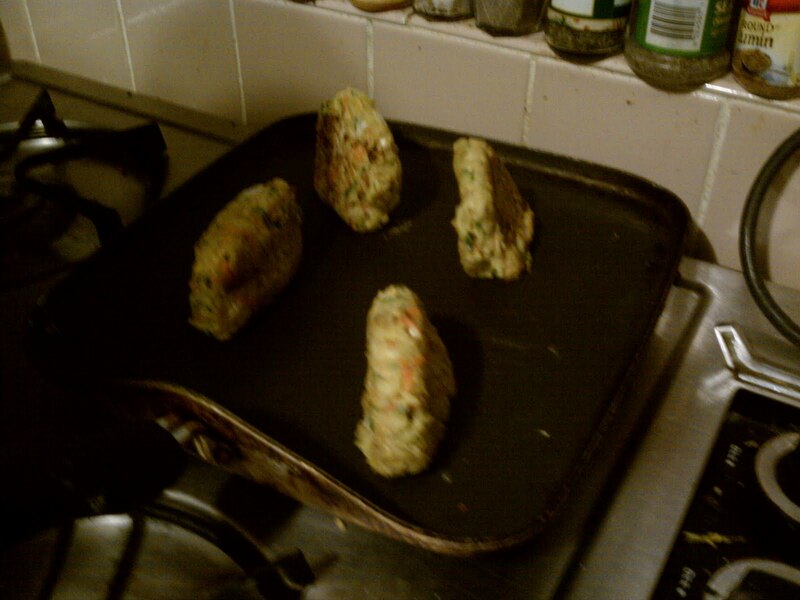 Making veggie burger patties was a fun experience, mostly because there was a lot of experimentation involved. 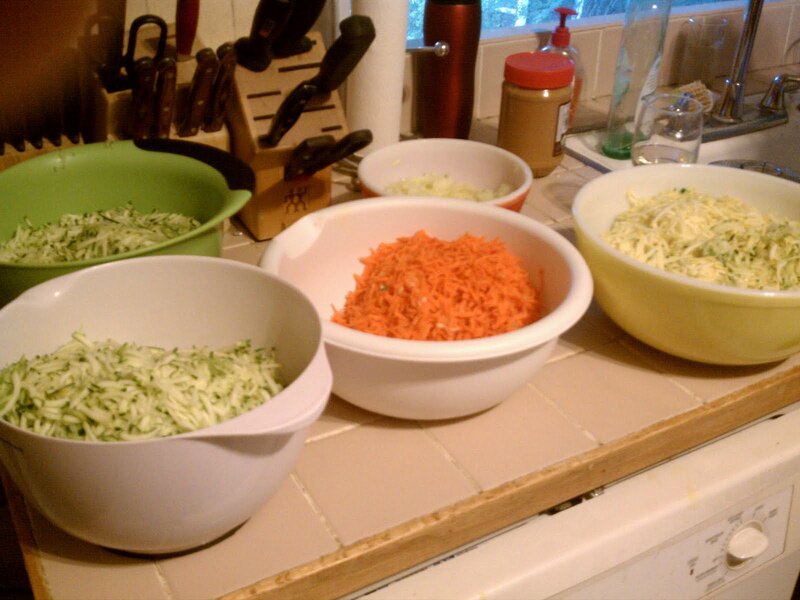 The recipe I used (shared with me by one Andrew Lind) was very straightforward: a lot of shredded veggies plus rolled oats, cheese, and an egg to hold it all together. Quite obviously, this is not a vegan or strict vegetarian burger by any stretch of the imagination. But since I was in charge of making all the burgers, I figured I had the freedom to make them to my liking. The experimentation came in to play in controlling the consistency and flavor. These are very soft and somewhat sticky patties. We added a few things to the original recipe to firm the patties up, including breadcrumbs. We also added a heck of a lot of spices. Full disclosure - I pre-cooked my burgers in a skillet on Thursday night to prevent the patties from falling apart on Saturday morning when I tossed them on the grill. When I make them for myself at home, I either put the patties straight onto the grill or cook them in a lightly greased skillet (just one time). 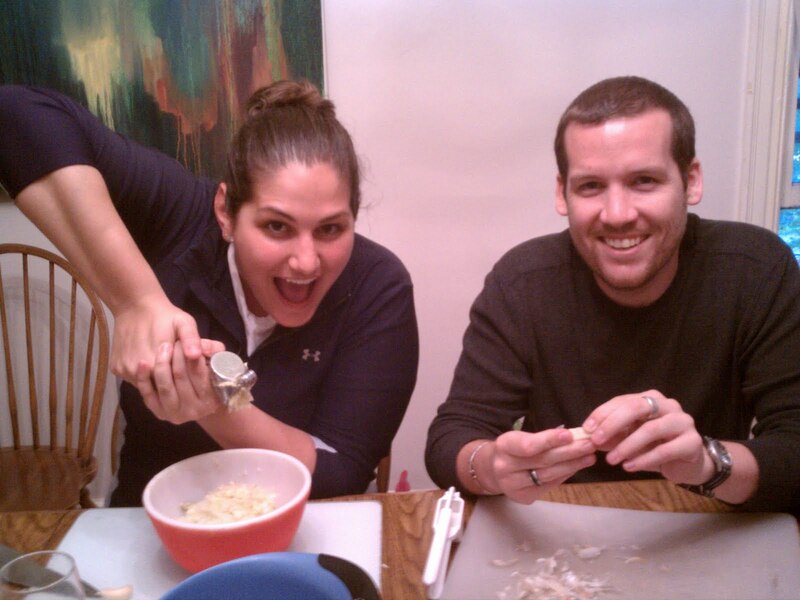 Stay tuned for Part Two, which will include recipe and day-of-game hulabaloo! Excellent as usual. Overheard people really excited about them while I was helping put buns and napkins and all that out.